We barbecue at our house most of the year. 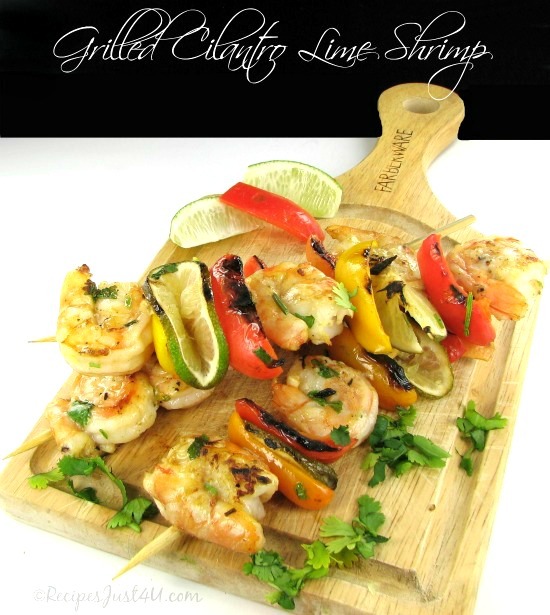 Normally, it’s chicken or beef that lands on the grill, but today I decided to add to my shrimp recipes with these grilled cilantro lime shrimp kebabs. We don’t get much in the way of snow in the winter so our outdoor grill is perfect for those nights when I just don’t feel like cooking and I can marinate something to hand to my husband to cook at dinner time. These kebabs are so easy to make and they taste just amazing. They are the perfect choice for the upcoming Cinco de Mayo celebration too! They are also gluten free, Paleo and Whote30 compliant. Using fresh herbs for cooking recipes add so much flavor that dried herbs just can’t impart. I’ve chosen cilantro to add great taste to these kebabs and to garnish them as well. Need a great side dish to go along with your shrimp kebabs? Try this Southern coleslaw.The dressing is just amazing! It’s time to fire up the grill for these grilled cilantro lime shrimp kebabs. Do you love 30 minute meals? So do I and this one is ready in far less than that! One of the things that I like most about these grilled cilantro lime kebabs is how colorful they are! The sweet peppers really add a great visual look and all the flavors really combine well. If it is too cold still for you to use the outdoor grill, an indoor grill pan works beautifully too. The indentations and raised areas of the pan will give you the “grill marks” just as though you had cooked these outside! 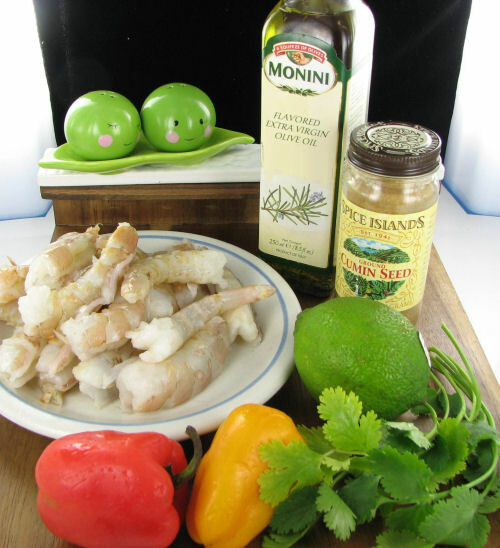 The ingredients are just a few: jumbo shrimp, limes, sweet peppers, cilantro, cumin, salt, pepper, and olive oil. TIP: If you are using bamboo skewers for this recipe, be sure to soak them in water for an hour or so before you grill them. They will hold up better with the heat of the barbecue grill if you do this. The main thing to remember is not to make the skewers too early. 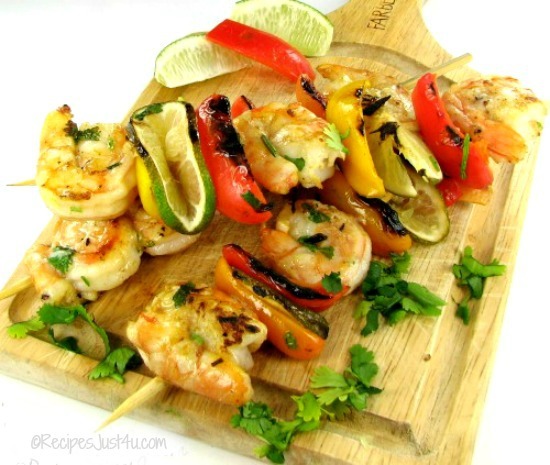 Lime juice will actually start cooking seafood, so the skewers need to be made just before you are ready to cook. I also made sure that the lime was not right next to the shrimp. I plan to drizzle them with lime while they are cooking. Aren’t they colorful? 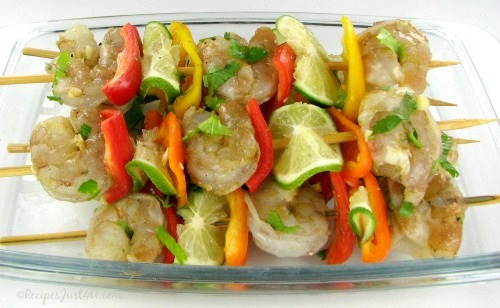 The cilantro and lime combine so well to flavor the shrimp and peppers. And grilling the peppers gives them a very different taste too. Even if you are not a pepper lover, you will like the way they taste. The flavor of these shrimp was just delicious. My husband loved them and they were great served with rice and a tossed salad. Fast, easy and perfect for any special occasion! If you are looking for a shrimp dish with a bit more heat to it, try my spicy garlic and parsley shrimp recipe. For more great recipes, be sure to check out my Pinterest boards. And for a great tasting party shrimp recipe, try these beer battered coconut shrimp. Season the shrimp with garlic, cumin, salt, pepper, and half of the cilantro. Set aside. Cut one lime into very thin slices. Don't make your skewers too early or the shrimp will actually start to cook. They need to be made right before you will be grilling. Peel and devein the shrimp. Thread six skewers, starting and ending with shrimp, and alternating with folded lime slices and peppers. Grill the shrimp on a stove top grill pan brushed with olive oil, turning occasionally, until shrimp is opaque throughout, about 1 to 2 minutes on each side. Top with remaining cilantro and squeeze lime juice right before serving. Serve with rice and garnish with lime. Thanks so much for the tip about soaking the skewers in water! I’d never thought of doing that before! It really makes a big difference in how they cook. They take the heat well if you soak.